Thursday March 6th 1902 I was down to the store and busy with the work. Will put the new tank at the well in place today. I was down home, at Fannies, and at Woolfs in the afternoon. The first time I have drove for some time. They are all [torn?] up fixing the house at Otts. Friday March 7th 1902 I did baking this morning and got the dinner. Will went to town in the waggon after dinner and I went along as far as Woolfs to spend the afternoon. There is a good deal of talk now about the right of way for the electric railway. Mollie went to town tonight. Saturday March 8th 1902 I did not have a very busy Saturday forenoon. I had early dinner and we took some things down home. Will went on to town. he was over to Lucas. their barn burned last night and their horses were burned. weather more pleasant. I knit all the evening. 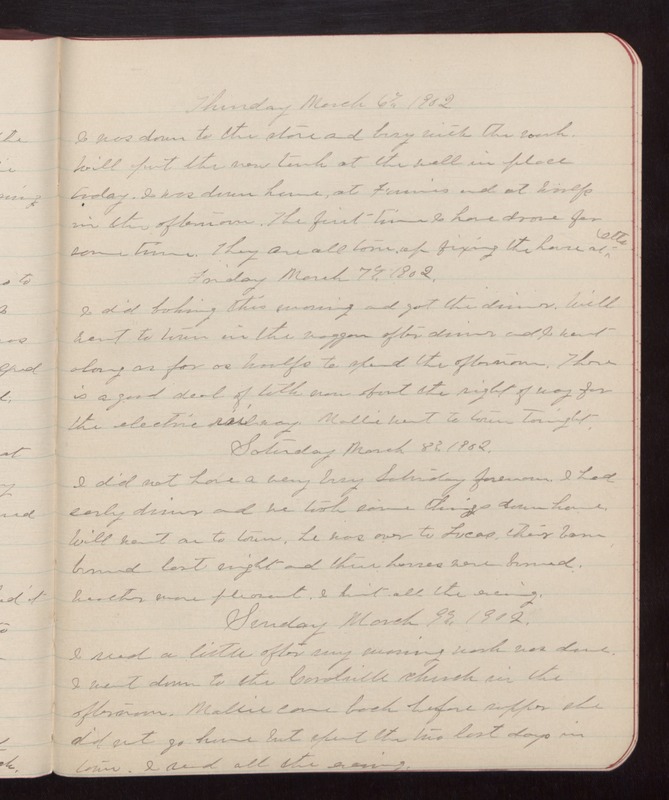 Sunday March 9th 1902 I read a little after my morning work was done. I went down to the Coralville church in the afternoon. Mollie canme back before supper. she did not go home but spent the two last days in twon. I rwead all the evening.